Which means that ther real resolution is not 20 mpx. but interpolation. Same as with the interpolation tool that photoshop offers. This is something inherent to all sony sensors. 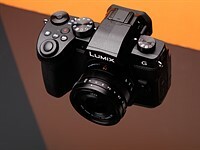 and has been pointed by dpreview and dxomark. If is not 20 detailed and focused megapixels then is not 20mpix. It has nothing to do with JPEG processing. This is nothing inherent to just Sony sensors but to the vast majority of sensors today. By your definition then the only widely available cameras that are acceptable are the Sigma Foveons. Every other camera doesn't have "detailed and focused megapixels" they are rated for due to how they process color. They interpolate. The actual effect resolution is lower than their marketing numbers. Only things like Foveon, a Bayer sensor that's been de-bayered to black/white and 3 chip sensors have "detailed and focused megapixels".